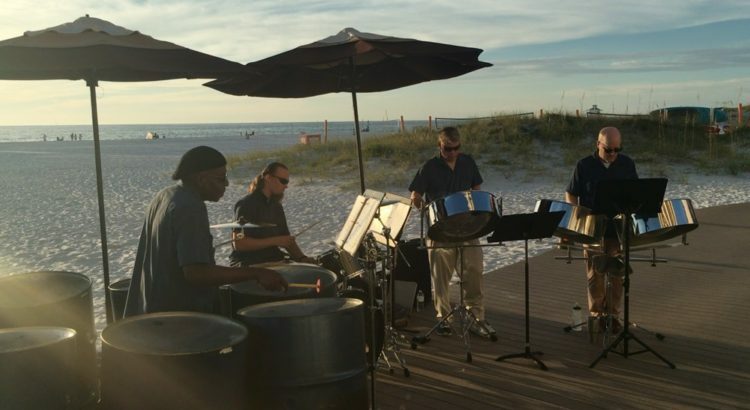 Our steel band quartet playing “Island in the Sun”, an old calypso by Irving Burgie. This video is 100% acoustic with no amplification or overdubs. Johnny is playing the bass pans, which are six 55 gallon barrels. The steel pan family mirrors the string family, so we can cover all the voices of a regular quartet with bass and guitars. This traditional steel band quartet puts out a nice full sound, and is something you don’t see very often. Thanks to the Sandpearl Resort and Khameleon Software for having us!